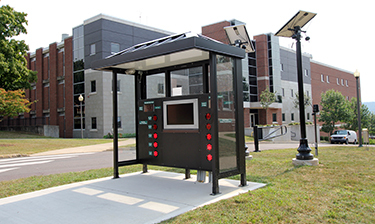 Anyone strolling around Bloomsburg University’s campus may have noticed a new kiosk resembling a bus shelter past the northeast side of Ben Franklin Hall. Behind it sits two light poles topped with solar panels. The kiosk is designed to educate the BU community about solar energy and the university’s energy consumption using Lucid Design Group’s Building Dashboard software. The project ultimately aims to develop energy-saving strategies for the university. The Building Dashboard touchscreen software will also allow users to take an in-depth look at energy use in five campus buildings: Hartline Science Center, Student Recreation Center, Nelson Field House, Columbia Residence Hall and Elwell Residence Hall. These buildings were chosen because they are popular with students or large consumers of energy. Bloomsburg University has teamed up with the Bloomsburg Recycling Center to change the way BU recycles. Since July 1, BU has used a dual-stream recyclable collection program that has increased the volume of recycled materials and made collection simpler and more convenient. Vince DiLoretto, BU’s custodial services director, and Charles Fritz, Bloomsburg Recycling Center’s environmental services administrator, were two key contributors in the new program. In September of 2012, for example, the university collected 15,650 pounds of recycled materials. During September of this year, the university collected 39,720 pounds — a 254 percent increase. Energy and financial savings are the goal of campus upgrades completed as part of Bloomsburg University’s facilities management department’s energy reduction plan. The plan aims to reduce energy consumption by 20 percent. One ECM now underway is the installation of energy-efficient LED lighting in the lower parking area and stairwells of the tri-level garage next to Elwell Residence Hall. BU facilities staff will install LED lighting fixtures purchased through a sustainability account initially funded by energy rebates from PP&L Electric. This project will pay for itself in 18 months. The same type of LED lighting was installed by BU facilities staff in areas within Redman Stadium. BU can now access real-time data on its solar array, located behind Ben Franklin Hall, thanks to Jeff Brunskill, professor of environmental, geographical and geological Sciences, and Nathaniel Greene, professor physics and engineering technology, who recently launched a website that features live data from power production to lifetime energy readings. Starting in 2008, a student-faculty collaboration transformed cooking oil into biodiesel fuel for a campus shuttle bus. When that pilot project wound down in 2010, excess vegetable oil was donated to the Town of Bloomsburg’s Recycling Center for use as a heating fuel. Bloomsburg University helped the Town to engineer and install a dual-fuel heating system for the Recycling Center’s main processing building. Waste vegetable oil and waste motor oil, dropped off at the facility by residents and businesses, are burned in a 350,000 BTU/hr furnace, alleviating costly heating bills. Used motor oil from the university’s vehicle maintenance garage is donated regularly. Local fruits, vegetables, breads and meats are available each Friday in September and April at the BU Farmers Market. The market, set up between Navy Hall and Bakeless Center, helps benefit the student environmental group Helping Our Planet Earth (HOPE). Sponsored by BU’s Green Campus Initiative and the Center for Leadership & Engagement, the farmers market is an outgrowth of the Earth Day tours in 2009 of Forks Farm, Orangeville, and Dancing Hen Farm, Stillwater. Replaced coal boilers at heating plant — two 1951 vintage coal boilers were demolished and replaced with a biomass (wood chip) boiler and a natural gas boiler to reduce emissions. The work was completed in 2010 under a Guaranteed Energy Savings Agreement and was partially funded with a $500,000 grant obtained through the PA Department of Environmental Protection. An additional grant in 2013, for $2 million from the PA Department of Community and Economic Development, will help expand the biomass project further. A planned second boiler will use wood fuel to generate both heat and electrical power. Use of more energy efficient windows — single-paned windows in Old Science Hall and Carver Hall were replaced with energy-efficient double paned units. Replacement of chillers — an old inefficient chiller was replaced in Scranton Commons with a more energy efficient unit that also serves Carver Hall. Replacement of light fixtures — old fixtures have been replaced with more energy efficient ones throughout campus. Installation of motion sensors — motion sensors have been installed to control stairwell and hallway lighting in the Hartline Science Center, with more projects planned for the Jessica Kozloff Apartments, Elwell Residence Hall and Nelson Fieldhouse. Installation or removable insulation — removable insulation has been installed on steam and hot water piping in the mechanical rooms of Bakeless, McCormick, Navy, Ben Franklin, Nelson Fieldhouse, the central Heating Plant, and the Buckingham Maintenance Center. Green corridors — an open space corridor was established encompassing the quad and the area between Northumberland and Luzerne residence halls. Construction and renovation materials — recycled materials, such as carpets and rubber flooring, as well as motion-sensor lighting are used in renovated buildings. Recycled paper — in 2012 the university transitioned from 30% Post-Consumer Waste (PCW) copy paper to 50 percent PCW copy paper. Computers — replaced with energy star rated models. Use of recycled paper in custodial services — all toilet paper is 100 percent recycled fiber, and paper towel products are 50 to 100% recycled fiber. New green seal cleaning products — the following cleaners are now green seal: glass, floor, general purpose, and bathroom/shower cleaner. New floor scrubbers — Tennant floor scrubbers, which use less water and improve safety, are being used in Hartline and Bakeless. Reduced use of chemical floor finish remover — new TomCat Edge scrubbing machines in Centennial, McCormack, and Nelson Fieldhouse allow for chemical-free floor stripping and use of less water. Green residence hall project — Northumberland and Montour residence halls competed to reduce energy usage and increase conservation awareness. Low-flow shower heads — older shower heads were replaced with low-flow ones in all residential buildings. Earth Day activities — Green Jobs panels were staffed mostly by BU alumni. National Teach-in — in on Global Warming Solutions - a campus-wide educational forum held as part of a national effort on global warming featured faculty, staff and students, as well as speakers from across the state. Drilling for Natural Gas in the Marcellus Shale — a series of lectures, films, and a panel discussion from March 20 to 29, 2012, most held on campus, explored the social, economic, and environmental impacts of drilling for natural gas in the Marcellus Shale. Commons Food Recovery — students from various organizations recovered five to six tons of food in an academic year from Scranton Commons. Students also donated Flex dollars to help community food distribution organizations. Recycling bins — 65 new bins were placed throughout campus, including each classroom at the Centennial and Hartline buildings. These bins accept together all plastics, glass, and can containers. Dual-stream recycling — University and Town entered an agreement for implementation and collection of dual-stream recycling effective July 1. Recycling material item are now being accepted in a dual-stream format – “CONTAINERS” AND “MIXED PAPER”. “CONTAINER” bins accept all plastics #1 through #7, glass (bottles and jars), and all metal cans. “MIXED PAPER” bins accept newspaper, office paper, file folders, phone books, magazines, envelopes, cereal boxes, books, catalogs, junk mail, and corrugated boxes. Significant increase in recycling totals since the initiation of dual-stream collection — September 2013 saw a 254% increase in weight of recycled materials compared with September 2012. Trash to Treasures — discarded items are sold annually, with proceeds benefitting the United Way. Electronic recycling — University recycled 14,816 pounds of electronic materials for 2012. Miscellaneous — scrap metals and mercury-containing lamps are also recycled.